There’s no question that the cloud offers many potential benefits. Major companies everywhere are lining up to reap the benefits by moving their back-office systems to cloud-based data warehouse platforms. Historically, company data was stored locally on magnetic hard drives or tape-based backup systems that were physically installed at the company’s location. This solution has worked fine for years, and is still a viable way to go. However, on-site storage systems have their drawbacks - they must be constantly administered, maintained and upgraded by a local IT department. With cloud-based data warehouse storage solutions, company data is saved on solid-state drives hosted externally by an outside service provider that handles the IT aspects of the data storage process. This frees up the company to concentrate on running their business, rather than running a room full of servers. According to a survey of 1000 senior IT executives by global telecommunications provider Tata Communications, only 28% indicated that their company uses cloud-based computing and/or storage solutions. That may not seem like a huge trend, but by 2024, that number is expected to double (55-60%). 37 percent reported that using cloud services lowered their IT costs. 67 percent indicated a streamlining of their business processes. 67 percent said they achieved reduced delivery times to clients and partners. 54 percent noted faster time to market for new products/service. 85 percent admitted that the cloud had "lived up to industry hype." Improved communications within the company. The obvious difference between cloud-based data warehouses and on-premise data storage solutions is the location where data storage is implemented. Below are some of the other advantages and disadvantages of cloud and on-premise solutions. 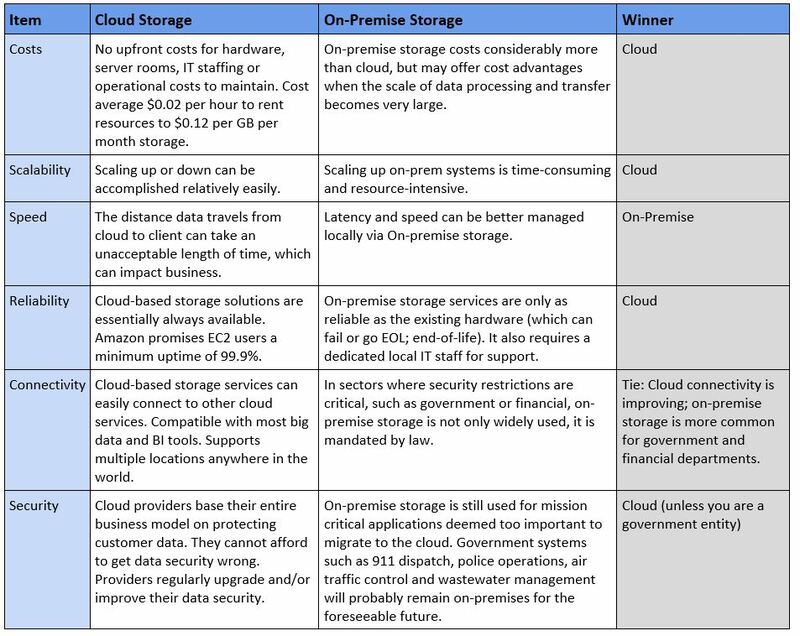 It’s close, but cloud data warehouses should be declared the winner and storage solution of the near future. Going cloud is great if you hate running out of hard drive space. If you have ever bricked your C: drive, the cloud might be for you. Cloud-based storage also wins with its overall low introductory costs and 99.9% guaranteed up-time; a percentage no local IT staff would ever make with an on-premise storage server. Considering these points, a careful examination of your needs is a good first step in making a choice with the cloud in view.